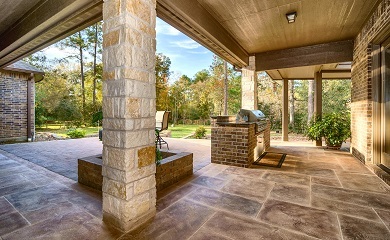 Do you have the perfect outdoor entertaining area? If so, chances are you also have a good amount of concrete or stone surfaces that require professional cleaning to remove built up dirt, algae and weather related debris. We specialize in restoring the beauty of your outdoor concrete and stone surfaces. Some of the items we clean for our residential clients are pools, pool decks, outdoor kitchens, fire pits, retaining walls, fences, sidewalks, stone paths and more. If your outdoor concrete and stone surfaces are in need of professional power washing services, give us a call for a free estimate. Outdoor Kitchens, Pool Bowls, Hot Tubs, Pool Decks, Retaining Walls, Fire Pits, Stone Paths, Patios, Sidewalks and other concrete and stone surfaces add luster to many backyards in the Atlanta area. In order to keep those surfaces and areas looking their best, routine professional concrete and stone surface power washing is needed. Give us an afternoon and we will return the shine and beauty to the outdoor features of your home. 1080 Pressure Washing offers a turnkey residential pressure washing experience. In addition to the concrete and stone surfaces in your backyard, we also offer professional roof washing, driveway power washing, gutter cleaning and of course house washing surfaces to all types of exteriors and siding including vinyl siding, stucco, brick and more. To learn more about these and other power washing services offered by 1080 Pressure Washing, give us a call at 678-849-1600 or click below for a free estimate.